Friday Goodness: Yummy Oatmeal breakfast. TGIF right? Lol. This post is meant for a reader, shes a subscriber on the food blog and asked me to help her with this. 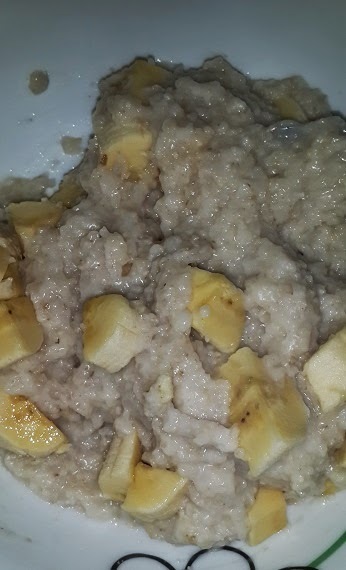 I didn't want to post it on the food blog alone because, i know someone else will benefit from this, its a very important food that everyone must try, young and old. This is a very easy, highly nutritious breakfast. 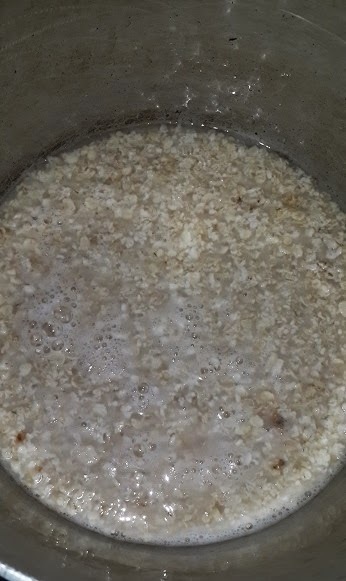 Oats and water in the pot. Allow to come up to a boil then keep stirring. This will take about 2 minutes to cook. 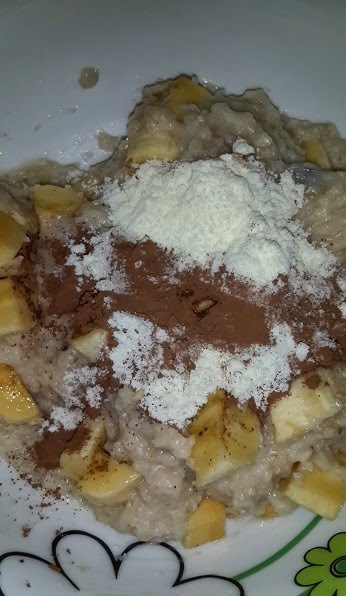 When cooked, pour the content into a small bowl, add the chopped bananas, cocoa powder and skimmed milk. Mix together. That's it! With milk and cocoa powder. Looks funny but tastes great. Lol! This yields a total of about 232 calories. If you are a weight watcher, don't substitute cocoa powder for milo ooo!! I don't add honey because the bananas provide all the sweetness. You can use pineapples or strawberries or yogurt(in place of milk) Make it your own. Just remember to keep it healthy and moderate. This meal provides all the nourishment you need to start your day, and best of all it lowers bad cholesterol which makes it good for the heart. Labels: Breakfast, low calorie, Oats dish. I love oats. I do this recipe but without cocoa but I will buy and try it. 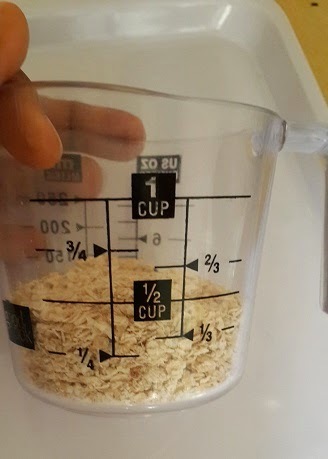 I don't cook my oats,I don't like the taste. I just add my water + skim milk + any extra. 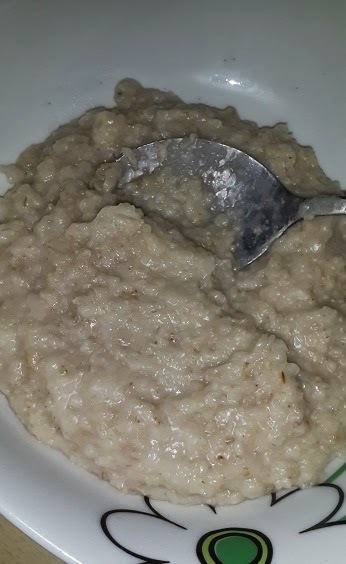 I "smoke" oats like garri with groundnut(1/4Cup). :D. Oats is versatile. Chidiebere. Yes, they sure are versatile. I haven't tried them raw though. Thanks dear. 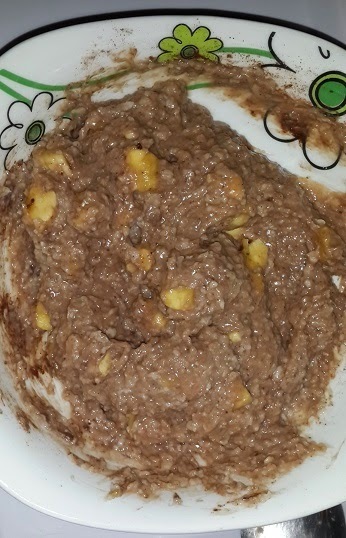 I do my oats in the microwave for two minutes..so I don't have to wash the pot ��..put the oats in the bowl..pour the milk..microwave for 2mins end of story...hehe..will try cocoa powder and banand tomorrow. . 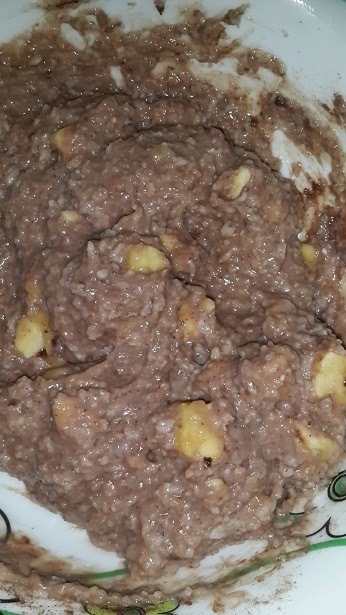 I make my oats in the microwave too.I have tried this recipe a number of times (without the cocoa powder) and it tastes great.I love oats, my friends know I don't joke with my oats. Hey Wunmi, how have you been? Keep up the healthy eating dear. I see you. And pls are peak milk, 3crowns and olympic milk bad for weight watchers? Hi Rhoda. If you can get the "low fat" version of those brands, that wud be awesome. As an adult, you dont need to be taking full fat milk. Thanks. Hi Cheliz, thanks for your good work. Pls i take my oat with Dano slim and glucose, then i take pineapple for lunch. Pls am i on the right track? Hi Chinyere, why not try honey instead, you will get more nutrition and taste to your meal. Pineapples alone for lunch is not so nutritious. Try and mix things up. Thanks.